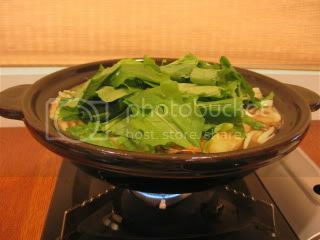 It's becoming a really nice season for donabe hot pot dishes. With our homemade miso, we've been making a lot of miso-broth hot pot lately. 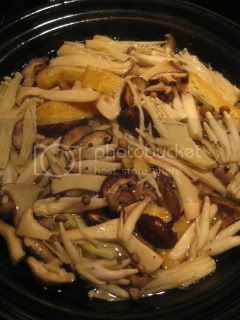 In the broth, mixed home sun-dried mushrooms, sliced abura-age, some kabu (Japanese turnip) wedges were simmered (started from cold broth). Once everything is cooked through, tofu was added. 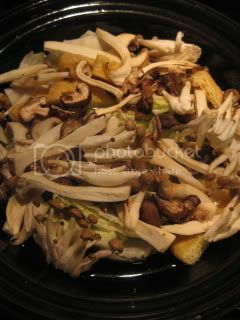 Then, when the tofu was heated through, kabu leaves were added. 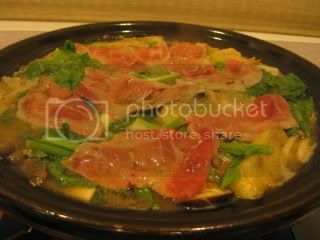 And at the end, thinly-sliced kurobuta pork (shoulder meat) was added. 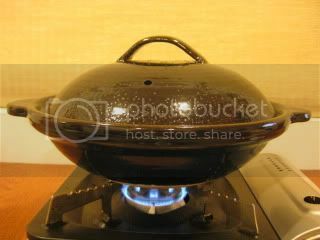 As soon as the meat was cooked through, the hot pot was ready to serve. And, we continued to cook more meat in it. The flavor was fantastic! Pork was so juicy, and the mushrooms were really flavorful. Broth was so soothing. For this dish, I used my beautiful Kyoto-style shallow donabe, "Kyoto Ame-yu". This style-of donabe is typical at Kyoto restaurants. Because the body is shallow, the ingredients cook faster and also it's great for presentation (the ingredients tend not to get "lost" in the broth like in a deep donabe). 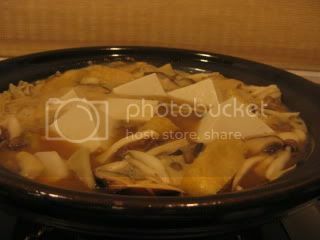 You can find the basic miso-broth hot pot recipe on toiro's website. You can choose your own ingredients to cook in the broth. For "Kyoto Ame-yu" we suggest that you reduce the recipe by half.